Nyssa modeling my first smocked dress attempt. Unfortunately, with a full time job and being a then (and now) single mom raising a little girl; the light reading, soft music and silence were few and far between, so other hobbies had to take their places. Until my sophomore year in high school, when I spent the summer with my grandmother and was bored to tears. She took me to the store and we got a simple A-line dress pattern with a tab front that could be changed up. She got a piece of colorful but inexpensive cotton, showed me how to lay out the pattern and cut the material and turned me loose with it. I made a dress! It worked! So she got me another piece of material and I made another dress! By the time my vacation there was over, I had a new wardrobe for school. True... they were all the same pattern but different materials and small changes in the details at the neck. I probably made six to eight dresses out of that same pattern before it finally fell apart. I made almost all my clothes in high school and college and continued making some after I was married and during med school. Gradually this ground to a halt as I became busier. Then along came a baby girl Nyssa. While I made a few things for her while she was an infant... it really wasn't until she was two that I started making play outfits and her dresses. I took two courses learning to smock, doing both geometric and picture smocking. She went to a school where the little girls had to wear dresses, so I smocked and smocked and sewed and made my own piping and even designed one smocking plate to go with Paddington material. In those days, I could take my yoke on the airplane and smock to my heart's content. I worked during the day, spent time with Nyssa in the early evening with piano and homework and baths; then when she went to bed around 8 PM I would sew until midnight. Each time I finished a dress, she would try it on and say in her most dramatic Southern bell drawl.... "Oh! Mom! It's so beautiful! I love it sooooo much! Thank you soooo much for my new dress!" Of course I would mentally say to myself... "Ok, that's good... how many more do you want and what color?" When I wasn't smocking dresses, I also made painted T-shirts, sweat suit sets, hair bows to match the dresses, Halloween costumes and a huge dress-up box with fancy little girl play clothes and a bride dress and veil. She and her friends spent more hours dressing up and making up plays with that box and the clothes and accessories made for six years of imaginative learning for them. So while I have a lot of hobbies that I enjoy... I picked "smocking" and "sewing" to highlight for today's photo hunt. Above is Nyssa in the first dress I smocked for her... a geometric pattern. In fact, it was the yoke front I used in my smocking class. 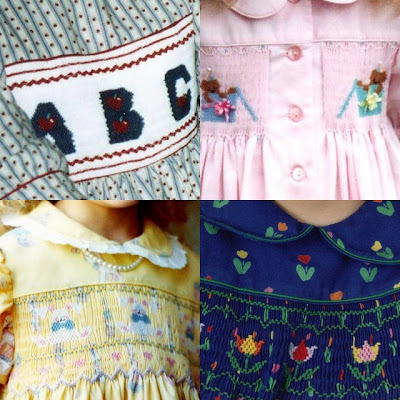 Below is a collage of four dresses I did in picture smocking. The best cotton material for smocking children's clothes is made by Robert Kaufman Co. The name is printed in the selvage along with a color dot code. These cottons are bright and vivid and unlike cheaper cloth, they wash beautifully. Even after fifty washes, the dresses haven't faded or lost body. Yes, I have ALL the smocked dresses I made for Nyssa carefully wrapped in acid free paper and put away for the remote chance that she has a little girl some day. Yes, Nyssa finally put an end to the smocked dress phase in the fifth grade and yes, it was before I was ready to be finished. I have at least two yoked dress fronts finished and two or three that are partially done. None have been sewn together. Yes, I am SO old that I DID take both cooking and sewing in junior high school; even took typing in ninth grade... all the girls did back in the dark ages. This isn't my only hobby of course. I have also done cross stitch, embroidery, craft quilting and scrapbooking. In med school we didn't have money for Christmas presents so I made most of them. I made quilted photo albums for family and cross stitched never-ending calendars that my parents still use today. I also made Mom a fancy artist's smock coat with embroidered fun figures all around the hemline that mom could wear in the reading circle with her little first graders. I do not knit or crochet. And I do try to get in a little light reading, soft music and silence too, at least once in a while. The theme for Saturday Photo Scavenger Hunt this week is "hobby". You can go here to "Grab the Scavenger Hunt code" and here to join the blogroll. This really cute logo is available there as well. The link to other participants is in my blogroll on the sidebar. I'm Thinking! Does It Hurt? Ask Me Again Later. "I Was Minding My Own Business , When......"